It’s not just your imagination—Reno’s 2018 summer average high was the hottest ever recorded in the area, and, as a team of landscapers, we certainly felt the effects of that heat. 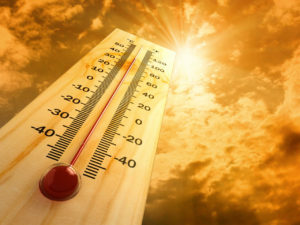 With no sign that the record-breaking summer heat will slow in coming years, we wanted to break down all there is to know about the higher temps…and what they mean for your landscaping, lawn or garden. According to the Reno Gazette-Journal, the average daytime high for June, July and August in Reno in 2018 was 93.6 degrees Fahrenheit. That number breaks a record of 93.3 degrees set the year prior in 2017. Unfortunately, that isn’t the only 2017 record that 2018 managed to break. In 2018, there were 20 days on record when temps in Reno hit 100 degrees Fahrenheit or higher—that breaks 2017’s previously set record of 16 days of 100-degree-or-higher weather. And, in 2018, the mean average summer temperature (an average of daily highs and lows) was 76.9 degrees, breaking the previous summer’s record of an average of 77.2 Yet another hot-as-ever record? 2018 saw 56 consecutive days where the temperature reached 90 degrees or higher. How does record-breaking heat affect landscaping and gardens? Diminishing Snowpack: Combine the increasingly hot summers with the fact that a warming climate means less precipitation falls as snow, and steady snowpack is no longer something local residents can rely on in the way we once could. In fact, according to the EPA, snowpack has been declining since the 1950s in the Great Basin. Less Available Water: Higher temperatures cause water to evaporate faster. And, according to the EPA, “The changing climate is likely to increase the need for water but reduce the supply.” Water evaporating faster due to heat, combined with an already decreased supply of water, ultimately means more severe droughts and drier, less fertile soil. What should I do to protect my landscaping, lawn or garden from the effects of climate change? Because of the impact of decreased snowpack, drier soil and less available water all around, drought-tolerable plants and xeriscaping are becoming increasingly popular options for residents looking to adapt their landscaping to the drastically changing climate. At Reno Green Landscaping, we have over four decades of experience custom-crafting innovative landscaping solutions for local residents that take into account the warming climate, unpredictable weather patterns and changing soil chemistry of the area. Reach out to our seasoned team of landscaping pros today to schedule a consultation for exceptional, climate-friendly, custom landscape designs.